The first ever p rivate museum focused on ceramic wares in the central province of Thua Thien Hue has been set up in downtown Hue City. 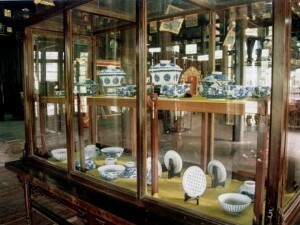 The museum is owned by archaeologist Tran Dinh Son, who is widely considered as a leading expert in ceramic wares from the feudal dynasties of the Ly, Tran, Le and Nguyen (early 11th century to mid 20th century). Son has amassed a huge collection of antique ceramic wares used in daily life such as cooking utensils and dishware which he has displayed at various exhibitions in and outside the country. The museum is located at 114 Mai Thuc Loan Street, which used to be a private mansion of Tran Dinh Ba, a royal mandarin under the Nguyen dynasty and also Son’s great great grandfather. After 1975, the mansion was converted to a State office, then a State-run shop before it was left unused for the last ten years.